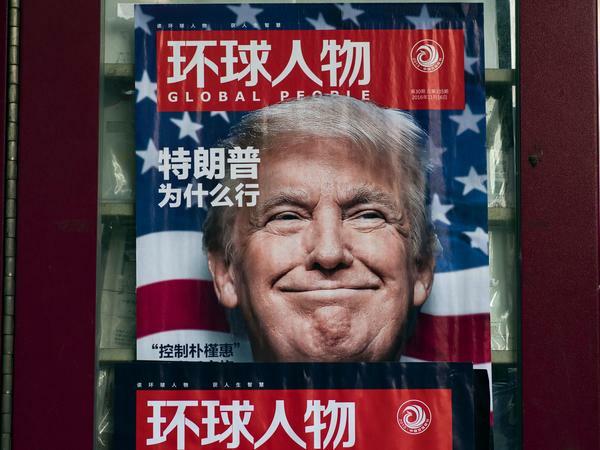 President Trump, shown here in an ad for a Chinese magazine in Shanghai, continues to attack the integrity of reporters who challenge him — even as he keeps making false claims. Like millions of Americans, I watched the new White House press secretary, Sean Spicer, as he tried to convince reporters and viewers last weekend that President Trump's inauguration was the most watched ever — "both in person and around the globe, period!" Spicer made his case even though photos of the National Mall show that attendance was much smaller than at Barack Obama's inauguration in 2009, which – incidentally – I covered. The next day, on NBC's Meet the Press, White House Counselor Kellyanne Conway tried to persuade host Chuck Todd that Spicer was using "alternative facts." When Todd pressed Conway on Spicer's falsehoods, she responded: "Chuck, if we're going to keep referring to our press secretary in those types of terms, I think we're going to have to rethink our relationship." To me, all this sounded like standard operating procedure in authoritarian China, where I'd spent a decade as a reporter. Like the new White House, the Chinese government has tried over the years to convince citizens not to believe their own eyes. For instance, when smog enveloped Chinese cities, the government would insist it was really just fog. This tactic grew increasingly absurd as air reached staggeringly toxic levels and people faced post-apocalyptic scenes that no propaganda campaign could overcome. The Chinese government is much more candid about its air pollution crisis these days, but still tries to manage reality and mislead citizens. Earlier this month, the government ordered provincial officials to halt smog warnings and then censored news of the order when it leaked. The continued mendacity only angers Chinese people and makes them more cynical. Some people have turned to demonstrations, with government responses varying from tolerance to crackdowns. People put surgical masks on sculptures in December to protest smog in the southwestern city of Chengdu. The government countered by deploying riot police. When under fire, another favored tactic of the Chinese government is to misdirect and then try to discredit the press corps. Conway took a similar approach last weekend. Faced with repeated questions on Sunday about Spicer's false statements, she went on the offensive, criticizing a Time correspondent who had mistakenly reported that a bust of Martin Luther King Jr. had been removed from the Oval Office. Conway's criticism was legitimate. The reporter, Zeke Miller, explained that the bust had been obscured from his view and corrected his report. He publicly apologized. But Conway wouldn't let it go and insisted the mistake reflected a deeper journalistic bias against Trump. "Why was it said in the first place?" she asked. "Because everyone is so presumptively negative." Since Saturday's debacle, Spicer has tried to improve his relationship with reporters, but continues to complain that the press is unfair. On Tuesday, he repeated that President Trump maintains he would have won the popular vote had not 3 million to 5 million "illegals" voted. There is, once again, no evidence that happened. Even as the president keeps making false claims that many fellow Republicans reject, he continues to attack the integrity of the reporters who challenge him. In a speech last weekend at the CIA, he called members of the news media "among the most dishonest human beings on earth." This reminds me of the way the Chinese government has spent years impugning the honesty of the international media and suggesting it is part of a broad Western conspiracy to keep China down. Last year, Wang Qiu, a member of China's legislature and head of state-owned broadcaster China National Radio, claimed that 60 percent of Western media reports smeared China. In 2013, Li Congjun, the president of the state-run New China News Service, urged the country to fight against anti-China plotting by foreign reporters. "Some hostile Western forces and media do not want to see a prospering socialist China," Li wrote in the Communist Party-run People's Daily. This relentless assault on the image of foreign reporters has been very effective. In 2012, I interviewed a man named Zhang about a bridge collapse, which everyone in town attributed to government corruption. Zhang's mother insisted on attending the interview and repeatedly told him not to speak with me because she thought my sole motive was to malign China and the Communist Party. "An opportunist like you is what they need," she told her son. I responded to all of this the way I'd recommend journalists covering President Trump do: Get out of the office as much as possible, report and spend a lot of time listening to ordinary people about their concerns. To help overcome distrust, I even created a free taxi cab service in Shanghai so I could randomly meet Chinese and interact with them outside the framework of a traditional interview. Reporters in China are accustomed to not-so-subtle threats from the government. So when Conway told Chuck Todd, "We're going to have to rethink our relationship," that felt familiar to those who've been warned by Chinese authorities to be more "objective" or risk not having their visas renewed. Since 2012, China has expelled two foreign reporters, but long waits for visa renewals have improved. Pressuring journalists is common in other authoritarian states in Asia, too. Nguyen Phuong Linh, who spent five years as a reporter for the Financial Times and Reuters in Hanoi, said Vietnamese authorities phoned her frequently about stories they didn't like. "Every time I quoted someone who said something against the official statement, they said, 'No, your fact is not fact," says Nguyen, who now lives in Singapore, where she's a political risk analyst. Government officials also pressured her. They'd say, "'I think we have to reconsider our relationship,'" Nguyen recalls, "exactly like Kellyanne Conway just said." Nguyen, who grew up in Haiphong, in northern Vietnam, always thought the United States was a "dream journalism environment" for someone like her who'd grown up under a repressive government. But when she watched Meet the Press on Sunday, she was shocked. "I was telling myself: 'Jesus, this is America! It's not Vietnam.'" Frank Langfitt is NPR's London correspondent. He served as NPR's Shanghai correspondent from 2011 to 2016 and as the Baltimore Sun's Beijing bureau chief from 1997 to 2002.